Four people living in an upstairs apartment are safe after a fire destroyed Ming's, a popular Belfast Chinese restaurant, early Sunday morning. Fire crews believe the blaze started in a box truck parked next to the building. 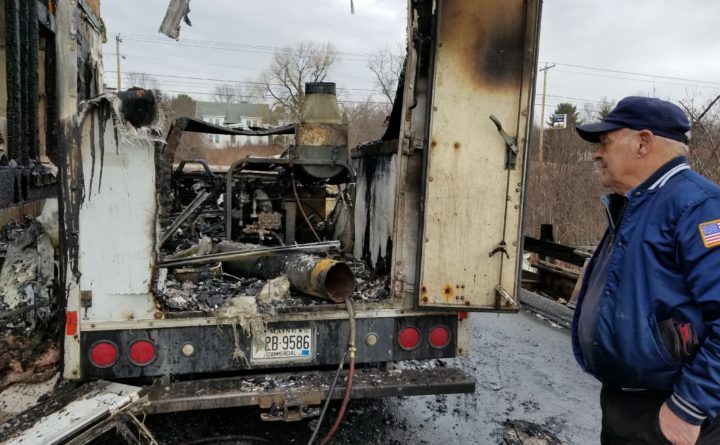 Belfast Fire Chief James Richards stands next to the box truck where a fire that destroyed a popular Belfast Chinese restaurant started early Sunday. Four people living in an upstairs apartment escaped before the flames spread to the second floor. 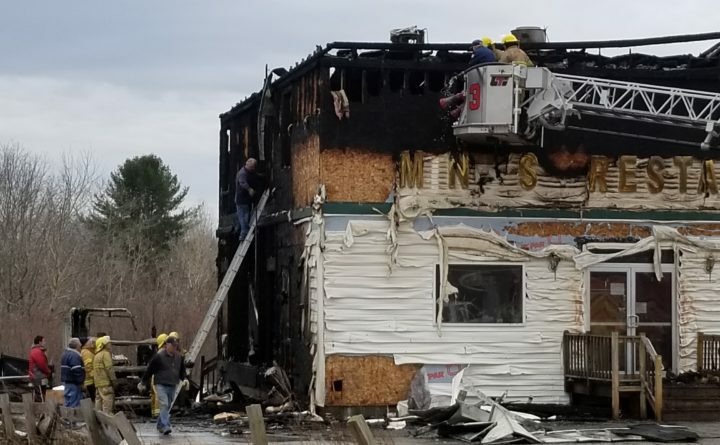 BELFAST, Maine — A popular Chinese restaurant was destroyed early Sunday morning in a fire that four people living in an upstairs apartment narrowly escaped. The first call came in around 1:15 a.m., but was reported as a vehicle fire, according to Belfast fire Chief James Richards. A contractor hired by the owners of Ming’s Restaurant to pressure wash the roof of the building had parked his box truck, which contained the engine that ran the power washer, next to the building. He was up on the roof when the engine apparently caught fire, setting the truck ablaze, according to Richards. Richards didn’t know the name of the contractor. The truck was parked about 5 feet from the building, and the flames quickly spread up the siding. The stairs that access the second-story apartment are located on that side of the building, but the residents were able to make it down before the fire spread too far. “They’re lucky,” Richards said late Sunday morning. By the time firefighters arrived, about 10 minutes after the initial call, fire had reached the second floor and spread throughout the apartment. The building’s tin roof made the fire difficult to stop, Richards said. The roof trapped the heat, and the water had to be sprayed in through the windows. Given the amount of water pumped into the building, Richards said he believes it will be a total loss. The building is insured. No one was injured in the blaze. Fire crews spent about 5 hours fighting the blaze, and returned later that morning to spend another 2 hours dousing hot spots and ensuring the fire wouldn’t reignite. All morning, drivers stopped along Route 1 to watch firefighters work for a few minutes. 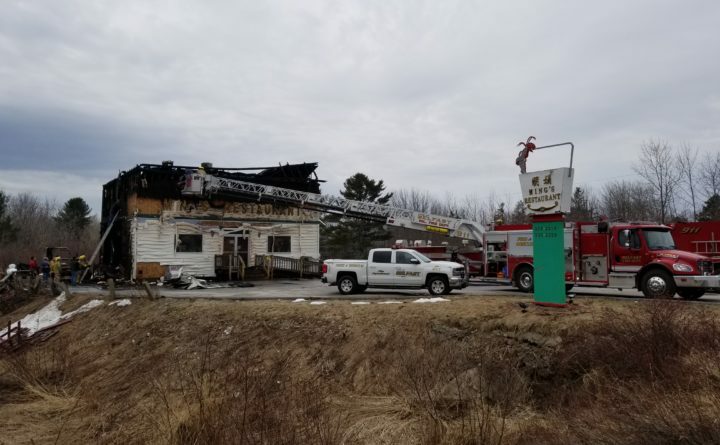 Crews from Searsport, Morrill and Belmont assisted Belfast, with about 35 firefighters on scene at the height of the operation. A state fire marshal’s office investigator is expected to visit the scene Monday to try to confirm the cause.